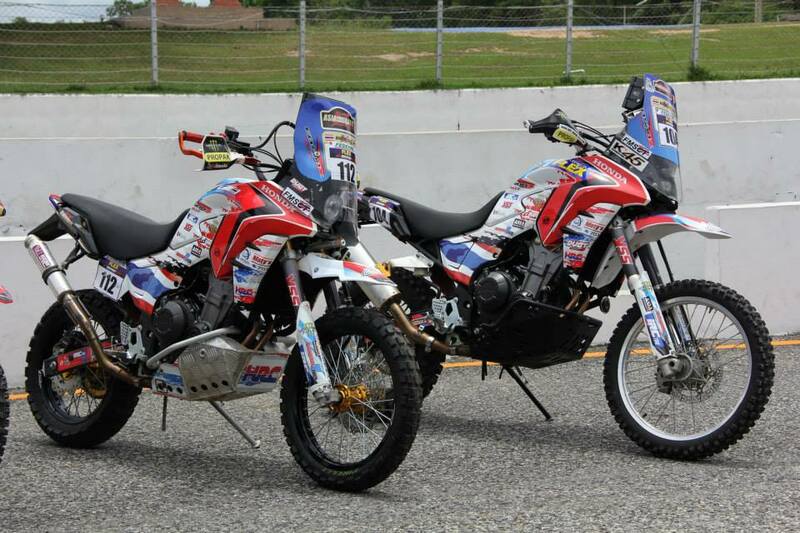 ← Is September 10th 2014 the day we will see the New Africa Twin? 2015 Honda Elsinore or Africa Twin? 500 or 1,000? Both? Neither? We’ve been following the rumor trail of a possible new Africa Twin. The idea of Honda bringing the Africa Twin back to the market has generated an extraordinary amount of posts from motorcycle publications and on motorcycle boards. These rumors centered mostly on “leaked” specifications about this bike, a patent from Honda on a dual air cleaner system, Honda’s renewal of U.S. trademark of names of discontinued Honda motorcycles, and an interview with Honda’s head of product planning in Europe. There were also a set of drawings by journalists, all speculating what this motorcycle would look like. And just recently, there was an announcement from Honda about a world premiere of an adventure motorcycle in Germany on September 10th. We believe the Africa Twin name, with its following and tradition would require something larger than a reveal just a few days before Intermot. But the rumors continue so let’s entertain the possibilities. The main issue was that it was a parallel twin and no longer a V-twin like the original bike. 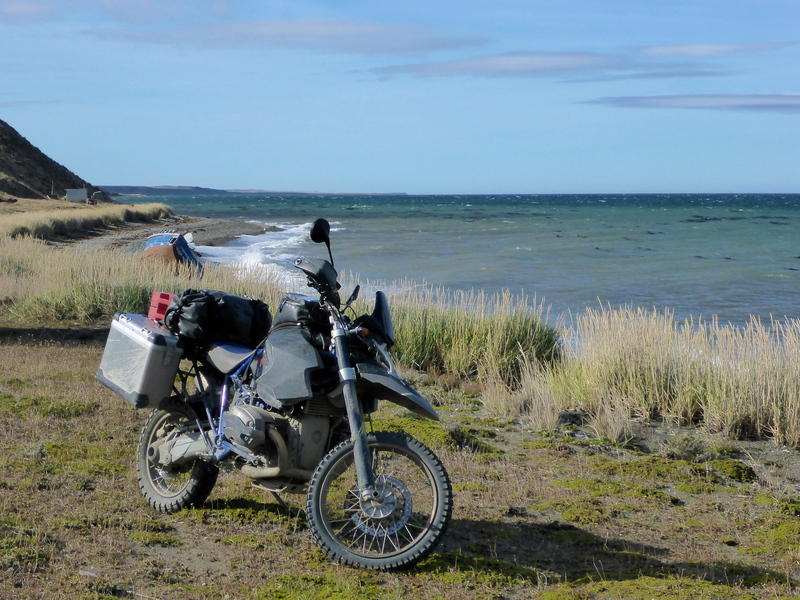 Many speculated the proposed 440lbs when fully fueled and ready to ride was not feasible to be achieved for a 1,000cc motorcycle with a 5 gallon tank, packing latest generation electronics and equipped with off road suspension. Although there is no consensus of what an ideal dual-purpose motorcycle should look like, most everyone agrees lighter is better, and more power is better. Add to this recipe road worthiness/comfort/cargo capacity for long distance travel and we have the holly grail for a boundary expanding new enduro/adventure/dual purpose motorcycle. The specs on this rumored Africa Twin were spot on for most people, if they are feasible to be achieved, that is. 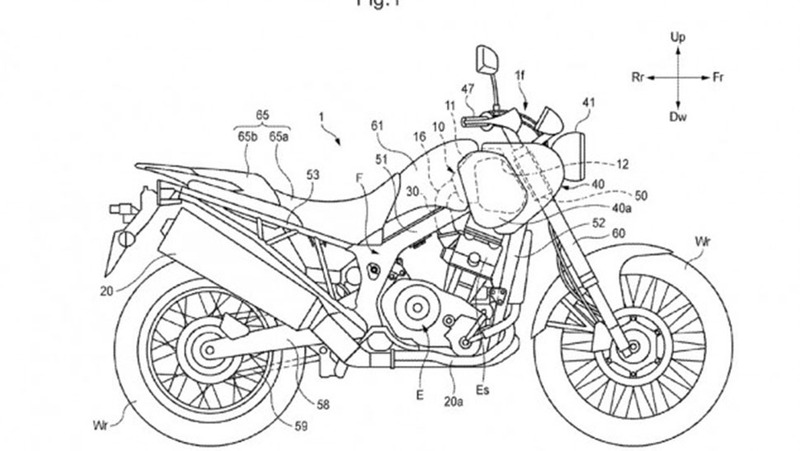 This is one of the most interesting part of the rumors – Honda’s patent for a new airbox system. It divides the aircleaner/airbox into two elements, one on each side of the bike, flanking the traditional tank/steering. It places the air cleaner where most motorcycles have the overhanging side of tanks. And it opens up space on top of the motor and under the seat (places where the airbox is traditionally located), allowing the heavy fuel to occupy the space in the center of the bike, just above the motor and under the seat. It helps in lowering the center of gravity of the motorcycle for one thing, and it facilitates air cleaner maintenance for another, an important item for off road vehicles. More on this further down this post. We’ve heard everybody would like to see a new Africa Twin. The official line is we can’t make any comment about any models that we are bringing in the future. But you can probably see by the look on my face that we probably will be thinking about something maybe… I can’t tell you when. But I think you probably will be happy eventually. This interview leaves no doubt about Honda bringing a new model, one that is based on what the Honda Africa Twin represented. At some point last year Honda renewed (filed) the United States trademarks of names of Honda motorcycles that have been discontinued, among them Elsinore and Africa Twin. These could be routine trademark renewals, with no intention of doing anything about them on the near future. We and most others speculating about an adventure bike from Honda mostly focused on the Africa Twin name. It makes sense in our opinion that it will be called Africa Twin, since the Africa Twin name carries a much larger tradition and following outside of the United States. The name in itself could be the marketing campaign. But we would not be surprised if Honda brings something else to the market, and based on the Elsinore name. As soon as rumors started, several motorcycle publications illustrated their vision of the new motorcycle. Follow this link to see these illustrations and our poll on five renditions of the new Africa Twin. Let’s just show you our favorite, and it is also the version that got the most votes on our poll so far. A couple of days ago Honda’s site in Germany announced the world premiere of a new model. On the site they had an illustration of a magician about to unveil a motorcycle. Is this it? Is this the new Africa Twin, we ask? Or is it something else? We will know soon enough. But we believe the Africa Twin would require something larger and with more reveal installments, with some leaked photos and other promotion steps geared to milk more from what the Africa Twin name represents. We are not keeping our hopes up for this reveal. But we will know more soon. Just when we were all set for the count down for what Honda will unveil on September 10th, assuming it could possibly be the Africa Twin, a new rumor hits the webs. This new rumor brings back the Elsinore name as opposed to Africa Twin. It is a name that is more meaningful for us here in the United States, where Africa Twins were never sold. Elsinore is associated with Steve McQueen and the California deserts! Elsinore is associated with smaller displacement, two-stroke Honda motorcycles of 125cc and 250cc from before the CRF line, one of the several motorcycles Steve McQueen used to ride (the list bikes associated with him is large, including Triumph and Ducati Scramblers, Husqvarnas, besides Hondas and Yamahas). As for the name, some recently filed Honda trademarks may offer up some clues. Two particular names stand out: Elsinore and Africa Twin. Both names carry a long tradition with Honda. The Elsinore was an early Honda dirt bike released in 1973, but they were small displacement motocrossers that preceded today’s CRF models. The name has the right retro-sounding appeal to it, but connecting the name to a 1000cc engine might be too much of a departure from the Elsinore legacy. “Africa Twin” might be an apt name, and the engine description would fit the bill. A new Africa Twin however would be more of an adventure tourer along the likes of the Yamaha Super Tenere or Triumph’s Explorer and the design in the sketches lacks the same rugged styling. We focused our attention on the Africa Twin name in our discussions. But are we talking here about the same bike? 1,000 or 500cc? Both? Neither? Here is where another component of the latest rumor comes to play. The Spanish motorcycle site SOLOMOTO.es is claiming that the adventure/enduro/dual purpose motorcycle Honda will reveal in the upcoming fall motorcycle shows (Intermot and EICMA), and perhaps it is what will be unveiled on September 10th as well, is not the anticipated 1,000cc Africa Twin, but instead a 500cc Elsinore. The 500cc displacement is a better match to the Elsinore name than 1,000cc. And the Motorrad illustration of what this bike could look like (depicted earlier on this post) better matches a 500cc motor than an 1,000cc motor. 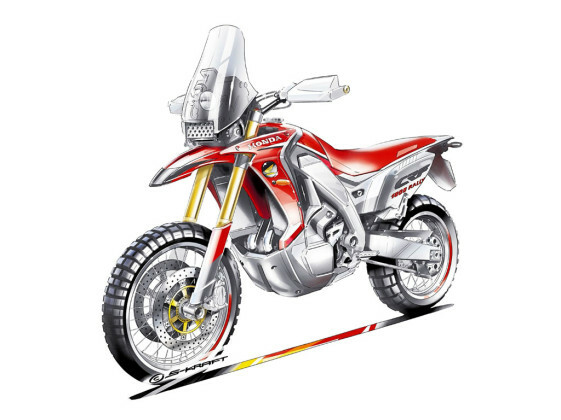 It makes it much closer to the 450 CRF rally motorcycle Honda uses in the Dakar and which appears to be the inspiration for the Motorrad illustration. Further on this SOLOMOTO post, they describe this speculated Elsinore to be an all new all-purpose adventure motorcycle with a two-cylinder motor based on the CB500 motor, a parallel twin liquid cooled, 8V DOHC motor with electronic fuel injection. On our first post about the speculated new Africa Twin we had sited Gizmodo’s Indefinitely Wild post of June 11, 2014, which described how Honda’s new airbox patent would work for a new adventure motorcycle. They quoted a Honda insider describing how the dual airbox design, instead of being on top of the motor and under the seat, was pushed to the outside of the tank, would allow the tank of this new motorcycle to stay on its traditional position, but its volume going deeper, lower on the motorcycle and more centered, by occupying the location traditionally taken by the airbox right above the motor and under the seat. SOLOMOTO indicated the Elsinore radiators will also be located laterally under the pair of air filters. They also mentioned it will be a very light with good power to weight ratio bike. An all-purpose bike with off road trail aesthetics. Previously “leaked” information indicated it as a brand new motorcycle with the motor nested inside a twin-spar frame and a tank of just less than 5 gallons. If based on a 500cc motor, 5 gallons would give you more than 300 miles between fills. The Africa Twin name is larger than anything on the Honda lineup when we talk about adventure/enduro motorcycles. Even beyond Honda, Africa Twin is a symbol for adventure/enduro motorcycles. If this bike is going to be made, I doubt it will be called something else other than Africa Twin. Unless Honda is planning two bikes, one smaller with a smaller displacement motor to be called Elsinore and one with a larger displacement motor to be called Africa Twin, we can’t see anything being called Elsinore in place of Africa Twin. The Africa Twin name is not going to be relegated. Particularly, we’ve been on a quest for the perfect enduro machine, the holly grail we described in the beginning of this post: the one that reaches the optimum compromise between dirt and road, light weight and suspension for the dirt but with good road manners for long distance travel. In May 2015 we had brought up the Honda CB500 Rally versions, as developed by the Thai HRC guys, as a possible bike that we would be interested in building to reach that optimum balance. It is inexpensive, it is light weight, has a smooth parallel twin motor, and we could possibly build it to our riding interests. However, radically modifying a motorcycle suspension and wheel sizes affect a bike’s geometry, and we do not know what these changes would entail in terms of handling. And riding a designed-for-the-street bike aggressively off road, even if the suspension can take rough roads, may bring other problems related to components of the bike not designed for that type of use and we would be bringing different sets of stress to an unknown frame strength. The CB500X is rated at 430lbs wet, which we considered good enough. It makes this speculated Elsinore 500 a more feasible motorcycle to meet the 440lbs specs rumored earlier this year. Our ideal scenario for the perfect bike sees it with a 750cc motor. However, between a 500cc and a 1,000cc bike, if they weigh the same, we will favor the 1,000cc. 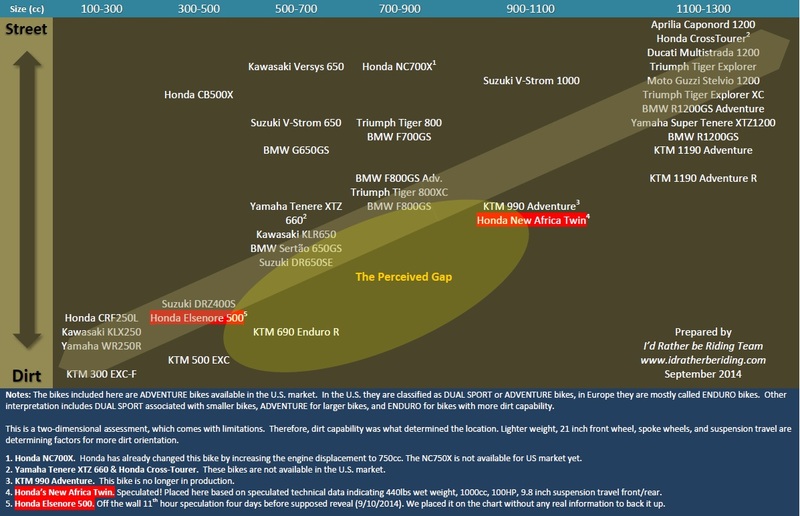 That is, between 430lbs for the 500cc machine (CB500X) and 440lbs for the 1,000cc machine (Speculated AT), we will likely go with the speculated Africa Twin. We favor the Elsinore name to the Africa Twin name for a smaller bike, if this is what Honda will bring. Reserving Africa Twin for a proper larger adventure bike. Elsinore denotes lighter weight and a smaller bike, and it is connected to Steve McQueen, and it speaks of the California desert. Worldwide, however, we know the Africa Twin carries a lot more weight with the public, and Honda’s marketing knows that better than us. So, we are not discounting the possibility of a new Africa Twin. But this new rumor opens the possibility for something else. Not the Africa Twin. In a few days we will know what we will have from this Honda world premiere motorcycle. An Africa Twin, an Elsinore, maybe both bikes and names in two different engine sizes, wheel sizes, and applications. Or something in between? Or maybe nothing. We think it will be something else. Meanwhile, let’s bring some perspective on the Elsinore name, here is a video of Steve McQueen riding the Honda Elsinore 250, with the two-stroke motor. The location of the ride is probably California. I ride fast, I ride fast on the dirt. I ride with safety equipment. If you ride on the street, be safety minded. Don’t ride too fast. That’s how I see it and ride as well. Fast on the dirt, not too fast on the street. And always with protective gear which, thankfully, is much better today than it was at Steve McQueen’s time. This entry was posted in Bike Reviews and tagged Africa Twin, Elsinore 500, Honda Elsinore, honda's new adventure bike, New Africa Twin. Bookmark the permalink. 3 Responses to 2015 Honda Elsinore or Africa Twin? 500 or 1,000? Both? Neither? Great article! You went to a lot of work producing the chart and researching the piece. I found this blog looking for more information on the rumoured Africa Twin. Hopefully we’ll see it soon. I want to see if it comes close to my ride. I’m 90K’s and a couple of years into a solo rtw and spent a lot of time thinking about a sub 400 pound (dry) 100hp+ bike. Such a bike exists, but not new, and requires a little (but not much) modification. Click on the below link. I saved maybe 20lbs with a full Ti Akropovich system, Shorei battery etc, to make up for the HPN 23 litre tank and lights/bikini. My range is between 220 miles (harder dirt) and 260 miles (paved). In addition in Argentina I carried a pair of Rotopax’s and will again in Mongolia “just in case”, giving me a range between 280 – 320 miles. Forks were upgraded to WP48mm, custom trees, rear to Ohlins. Minor parts upgrades from HPN racing. I’ll leave it to you to speculate on the dirt/paved performance. I have a second bike project underway at home being put together with a friend that should exceed the above specs and would love to start an Africa Twin project as well. The hard boxes (31 litre) might raise a few eyebrows. I like to take one duffel away from the bike, or locked in a room, and know the balance of my gear is reasonably secure. For instance at borders, on a ferry, walking a market, or anytime you need to leave the bike unattended, which is frequently solo. Otherwise I would have gone with soft bags. Thanks again for a great article. Subscribed and looking forward to your updates. Hey Jeremy. Nice bike! You are living the dream! Like the KTM SE in the KTM line up, your motorcycle was short-lived in the BMW line up. Why? For the same reason we are skeptical the new Honda Africa Twin will offer all the touring amenities we want and still be light, and still have good dirt manners, and still have plenty of power. There is always a compromise on technical issues or cost taking it away from us. And at the end of the day people buy the R1200GS and GSA and the KTM950/990/1190 Adventure models instead of the more enduro aggressive bikes. But with the appropriate modifications, as is the case of your nicely built bike, we get the bike we want. But it requires us building it. Which in the end is the way to go and there is something good about it as well. But we can continue this conversation on the other side of the New Africa Twin official announcement, when it happens, if it happens. Maybe they will prove me wrong and I will be glad about being wrong about it. Once again, Jeremy, you are living the dream! Congratulations!